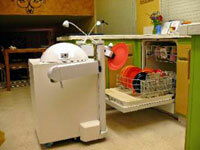 The Readybot Challenge, a non-profit club of senior engineers and designers headquartered in the Silicon Valley, California, has created a prototype robot capable of cleaning your kitchen. Equipped with two human-sized arms, the Readybot is capable of picking up various objects, dumping leftovers in the trash can, and even loading the dishwasher. According to its developers, this low-dexterity robot can currently perform up to 40% of common household daily chores. The engineers predict that with time, the robot will be capable of performing twice as many tasks. There is no doubt that Readybot is one dream that may actually come true, as the company predicts it will be available for mass-production in as little as two years’ time. The latest version of Readybot, designed as a proof-of-concept, demonstrates how much work a general-purpose, moderate-dexterity robotmade of simple, common materials can accomplish. “People ask what will be the breakthrough application for consumer robotics” comments Tom Benson, team leader, “we think people want a robot that can clean the kitchen.” Readybot is composed of a white enamel box with wheels, antenna-like cameras, and two human-sized arms. Although it is quite compact, this robot steadily raises itself up to human height when activated, so it can reach most kitchen closets and surfaces. 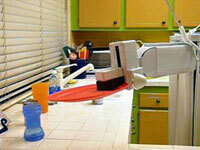 In addition, the robot is equipped with several custom tools, which can be used for cleaning purposes. The Readybot moves very slowly, and therefore, does not pose a risk to pets, small children, or to people of any age who are in its proximity. A short video of Readybot in action can be seen here. Judging from the demonstration, the Readybot still has a long way to go before it will be able to relieve us of our household chores. However, there is no doubt that this is a significant step in the right direction. TFOT recently covered other robots that were developed to assist humans in performing various tasks. These included JPL Robotics’ Lemur (Limbed Excursion Mechanical Utility Robots), which was designed to address maintenance issues on Spacecrafts and Space stations, OmniTread – a snake-like robot capable of climbing high vertical obstacles such as stairs, and “BigDog” – a four legged robotic mule designed to carry equipment and supplies for military ground forces, even when moving across rough terrains. More information on the Readybot can be found on the official Readybot Challenge website.